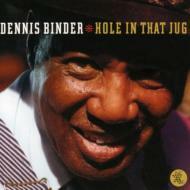 Dennis Binder, pianist, vocalist and composer originally from Rosedale, Mississippi, has been an active member of the blues community for over 50 years. As a young man, Dennis refined his technique and music knowledge in Chicago. Determined to become a professional musician, he hung around the Chess Records studio, and eventually cut four songs for the label. In the 1950s he recorded for Sam Phillips at Sun Records, and in Clarksdale, as a featured vocalist/arranger on recordings that Ike Turner set up for Modern Records. Dennis has remained musically active in Lawton, Oklahoma, performing in local clubs and releasing several self-produced CD's of blues, country, and inspirational music. After a fifty-year hiatus from the national scene, he has resumed touring throughout the United States and internationally with recent performances at major festivals around the world.